Council is reviewing all geothermal provisions in the Regional Natural Resources Plan and Rotorua Regional Geothermal Plan. The Regional Policy Statement will not be reviewed, so this is our starting point. Reviewing our understanding of the resource (e.g. research, monitoring and modelling). Reviewing and monitoring the effectiveness of current planning provisions. Developing system management plans (a whole system approach) to inform policy. Identifying the community's values through community engagement. Weighing up different management options and their costs and benefits . 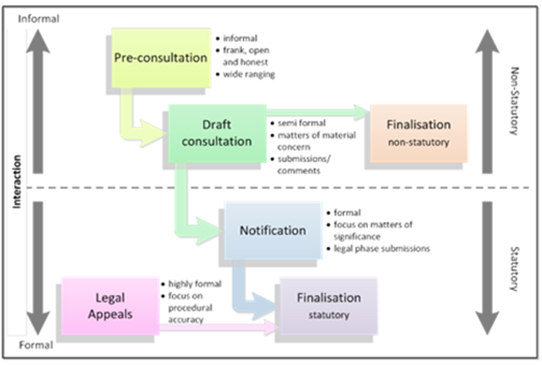 From this work we will develop informal draft plan provisions, before a formal plan change is publicly notified for submissions under the Act. The Regional Policy Statement requires system management plans for some geothermal systems including Kawerau, Tauranga and Rotorua. System management plans ensure that where a system is being heavily used (either by a small number of larger users or by multiple small users) it is managed on a whole system basis in a sustainable way. What does an SMP include? The content for a system management plan is set out in the Regional Policy Statement and includes objectives for its overall management and strategies to achieve the objectives. However, there is no set template and it may take on varied forms and include additional information as suits the system to be managed. Although it is not a statutory document, for Rotorua and Tauranga in particular, the content included in the system management plan will form the basis for changes to the geothermal provisions of the Regional Natural Resources Plan and the Rotorua Geothermal Regional Plan. For other systems (e.g. Conditional Development Systems), the system management plan might form part of information submitted in support of resource consent applications. Where there are a large number of small users, such as in the Rotorua and Tauranga systems, the Regional Council will prepare the system management plan. Where there are a small number of large users, the consent holders will generally prepare the system management plan. Engagement with the community throughout the plan review process is crucial. We are starting our engagement in the Rotorua area and will extend this more widely over time. At all key stages of the plan review, we will hold targeted workshops with interest groups (e.g. well owners, direct heat users, tourism operators), and the wider community. Hui are underway to ensure the multiple interests of Māori in geothermal management are provided for, and these will continue throughout the process. Please contact BOPRC if you'd like to be added to our database and be kept informed. Geothermal surface features include geysers, springs, mud pools, steaming ground and geothermal vegetation. Assessing the significance of geothermal features is important to ensure that significant features can be protected, that we understand why these features are valued and the effects we need to manage. Although a large number of geothermal features have been identified in the Bay of Plenty, they have not been classified in a way that takes account of their status as taonga, outstanding natural features or their significance as indigenous vegetation or habitat. The Regional Policy Statement includes criteria (Appendix F) to be used to reach an overall judgement of the significance of features. We are carrying out a process to assess the significance of surface features in the region, in consultation with landowners, as part of our geothermal programme. The Resource Management Act 1991 requires Council to review its regional plans and make the information publicly available. Council has looked at the effectiveness of the Regional Water and Land Plan geothermal provisions (now replaced by the Regional Natural Resources Plan) and the Rotorua Regional Geothermal Plan. For more information please see the links to the Review of Geothermal Provisions and the Rotorua Geothermal Regional Plan Review 2010 below.